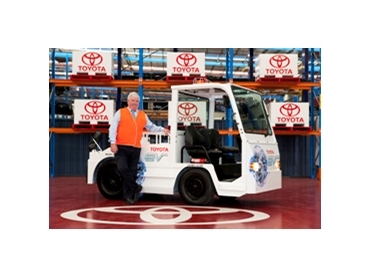 Toyota Material Handling Australia (TMHA) will soon launch a range of electric-powered towing tractors in Australia. The company has begun industry trials with a forward-control 1.8-tonne draw bar pull 2TE18 model. Toyota 2TE18 electric towing tractors have one-fifth the energy usage cost of a comparable diesel-powered tractor, and their greenhouse gas impact is half that of a diesel equivalent. Toyota electric towing tractors can tow up to 25,000kg and have potential applications with airlines, courier companies as well as indoor manufacturing and processing plants. These electric tractors use proven inverter and AC motor technology from Toyota's 3.5-tonne payload battery electric forklift range. The electric-powered Toyota tractor recovers energy when braking, coasting and changing direction by regenerative braking. Regenerative braking is the process where the tractor's kinetic energy is captured as electricity (by the electric motor acting as a generator) rather than wasted as heat through the friction brakes. Toyota Material Handling Australia's brand manager, Bob Walmsley said the electric-powered towing tractor offered significant operating cost, environmental and OH&S benefits compared with a diesel tractor. "The whole-of-life cost of an electric tug is significantly less than an internal combustion tractor," he said. "The cost of energy is 20 per cent that of a diesel tractor, and the CO2 emitted while generating the electricity required to power it is half that emitted by a diesel tractor." Mr Walmsley said maintenance costs are also low, thanks to the use of an AC motor and simplified power train. Additionally, the 2TE tractors have LED tail lamps, which require less power to operate and have extra-long life. Toyota's 2TE electric towing tractor is offered with 1.5 or 1.8 tonne payload - both with 80V/ 445 Amp hour battery or optional high capacity 600 Amp hour battery. Both models are 3615mm in length with a tight turning radius of just 3295mm. The battery charger interface has a lock-out system so the tractor cannot be inadvertently driven while it is connected to the charger. The inching control provides a variable time pulse so the operator can align the machine with the haulage pin allowing for one-person operation when attaching the trailers. A rapid opportunity charger is used to replenish the 80V battery.